Computer arithmetic is a fundamental discipline that drives many modern digital technologies. High-performance VLSI implementations of 3-D graphics, encryption, streaming digital audio and video, and signal processing all require fast and efficient computer arithmetic algorithms. The demand for these fast implementations has led to a wealth of new research in innovative techniques and designs. Advanced Computer Arithmetic Design is the result of ten years of effort at Stanford University under the Sub-Nanosecond Arithmetic Processor (SNAP) project, which author Michael Flynn directs. Written with computer designers and researchers in mind, this volume focuses on design, rather than on other aspects of computer arithmetic such as number systems, representation, or precision. This volume presents the results of a decade's research in innovative and progressive design techniques. 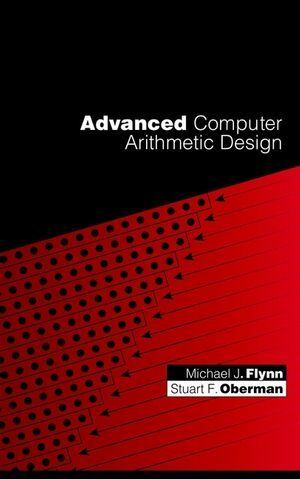 Covering all the most important research topics in the field, Advanced Computer Arithmetic Design is the most up-to-date and comprehensive treatment of new research currently available. MICHAEL J. FLYNN is Director of the Sub-Nanosecond Arithmetic Processor (SNAP) project at Stanford University. For the past decade, he has been the leading source of published research in the area of computer arithmetic design. Stuart F. Oberman earned his Phd at Stanford University and is currently manager of VLSI Design at Nishan Systems, San Jose, California. He previously worked at AMD, where he was the architect of the Athlon floating-point unit. His research interests include new algorithms for high-speed computer arithmetic, high-speed switch-fabric design, and architectures for high-throughput network processors. Multiplication with Partially Redundant Multiples. Technology Scaling Effects on Multipliers. Minimizing the Complexity of SRT Tables. Using a Multiplier for Function Approximation. High-Speed Clocking Using Wave Pipelining.